Howdy all. 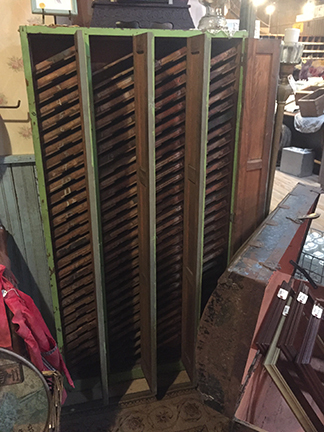 I ran across this type cabinet today and I have never seen one like it — but, I am a rookie and have not seen much yet … It is 4’x5’x1’ deep. 4 cabinet doors open to reveal 29 spaces in each that hold cases that were around 8”x10”. The cases were marked with the size and font name (hope that is correct reference in this instance) — I could not find a manufacturer name, so it could be a custom build? What is your knowledge-stream? See attached. I’ve seen a couple of these before, and for some reason I associate them with type foundries. Obviously, they will store individual types without any falling over. Early *Ludlow* .Matrix storage cases perhaps.?? 36 Point, Goudy Old Style, >pictured< does check out to around 1915. Modern Ludlow Racks/Cabinets, although Punched Metal appear to follow the same basic format.! With Divisions. Plus the larger Number figures at R/H. side look very much like the number of mats (full compliment) in modern *Ludlow* matrix racks/cases. 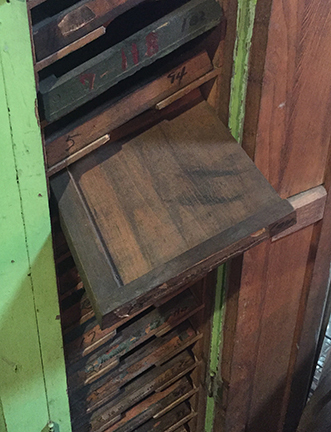 Cabinet for holding All-Purpose-Linotype mats? I have seen identical cabinets in the late Dave Churchman’s garage. In that case, they were used to store dingbats for Sterling Type Foundry. I have a 2-tier slanted wooden galley cabinet similar to your photo which still has the Hamilton decal at top center. I’ve seen a number of them. The differences being, mine does not have doors, it is 2’ deep, and the slant on the shelves are not as steep as the ones in your photo. “Half Rim Galleys” aka “Common Galleys” have sides on 1 end and 1 side, which appear to be what you have. Half Rim Galleys could be ordered in 8”, 10” & 12” lengths (in addition to longer) which would work with the 1’ cabinet depth you listed. I’ve not done a thorough search but I have not noticed any specific makers of Common Galleys with one edge beveled to fit as shown in your photo. ps… I should not assume that your galleys have rims on only 2 sides. If there is a 3rd rim on the back edge I would think they were custom made or cut from larger galleys. Gentlemen, thanks for the history lessons … what an incredible knowledge-stream here. The letterpress future will certainly be grateful for each of you and for this kind of narrative should BriarPress continue, we could only hope each of you are writing something of your experience at whatever level — Mr. Baranowski, the galleys indeed have three sides. And I did not check the top center of the cabinet for a decal. Folks, the scale of the slides is much smaller than would be used for mat storage. The width is about a foundry line (36 picas). Open only on the uphill side. Hmmm. It is hard for me to truly appreciate all the insight as I have had not enough exposure to the intrinsic nuances of the history of the craft … but it is a virus for me and I can’t get away from it. Now I am always looking and asking about the whereabouts of old letterpress related thingys. I would never have given the cabinet a second look before a year or so ago and today I spotted it from across the room and knew it had to have some relation. You all keep filling in the blanks, we are listening. I always thought these were referred to as “letter boards”, the boards being the dept of the cabinet, but open on one long side. I’ve picked up a few of these from trade typesetting (linecasting) houses and figured they were better for rough handling/shipping than a traditional galley. Old catalogs do give reference to letterboard cabinets. Usually wooden cabinets with boards open on at least one side to slide matter on an off. If you were about to print a book and had set up and proofed all the matter…you would need somewhere to store the page corded type before imposing into forms? 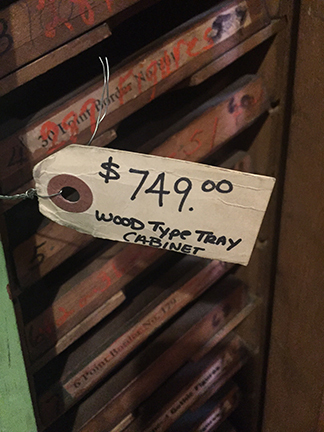 I would maintain that this is a galley cabinet designed primarily for type foundries and it is not a letter board. In later years, letter boards were made from steel—both Hamilton and Thompson in the U.S. made them in steel as they switched from wood. Thompson’s catalog 47 (from 1947) lists both wood and steel letterboards in 2/3 and full size case sizes, and Hamilton by 1951 was offering only steel letterboards in 2/3 and full case sizes. These were also incorporated into various designs of imposing tables that could be configured with regular galleys, chase units, furniture units, drawers, etc. I have an 8 ft long Hamilton imposing table here in the office with space for 200 galleys plus a letterboard unit. Letterboards are a completely different animal from the galley cabinet picture posted. Thanks Fritz and all others for your input. The typography guru site reference is great for converting a typographic term from one language to another, and for that reason I’m glad you made me aware. Most of the equipment terms are overly simplified. I would shy away from using it as a primary source of definitions. The example quoted in the guru site leaves out the point that commercially made letterboards utilize a rabbeted (offset) edge so that forms can be smoothly transferred to-from a galley by resting the galley’s edge on the letterboard. A letterboard’s open edge is not flat as you might imagine from the illustration or as seen on some home-made versions converted over from type cabinets. The same offset applies to the transfer of type from a galley to-from an imposing stone. The stone is elevated slightly from the coffin / table it sets in. Curiouser and curiouser! I thught I could quickly identify these but came up short atfer looking in my old specimen and equipment catalogs. I can tell you that the specific purpose was to hold 36 pica line sorts coming off of a caster(ATF, Monotype, Thompson, etc. so you will find them in places casting type. 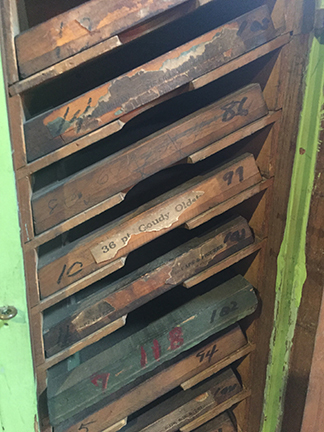 X-amount of lines for each character were cast and each was placed in one of these trays. When an entire fonts had been case it was then easy to go to the trays and pack the face as a complete font per the count scheme for it. Since it was specifically for those casting their own type, it was not necessary to be shown in type specimen catalogs. Not incidentally, these are EXCELLENT for storing you borders. Everything is standing up in rows when you pull the tray out f the cabinet and you can quickly visualize and calculate the amount of length you have available. I also use Linotype slanted matrice cabinets for storing borders in this manner. Hello, I have the exact same cabinet, and just saw your posts. Are we calling it a letter-board cabinet? And, any idea of the make, Hamilton? or value $, as I am getting ready to sell mine? The top galley at the very left end of the picture is a much older version with the three sides lined with brass channel—very classy and much nicer than the all wood versions. Ah, the plot thickens!!!!! Of interest to everyone is the fact that there will be one of these cabinets (four individual columns, each with a door) that will be auctioned off in Denver this June as part of the Jim Grisenti Auction that will be part of the APA Wayzgoose. I believe that all the spaces are filled with trays. The typ e, borders and ornaments that were in the cabinet have all been removed and will be sold individually as individual units. Early in this discussion Butch mentioned that he had seen an ATF paper label on one of these cabinets. Today I can tell you that the one I had seen last year will not be going to auction in June because the family decided to keep it. In the process of cleaning it up (it is beautiful with its original unpainted finish) they have discovered that “American Type Founders” is engraved on the metal tabs on the top of each of the four columns of wood galleys. So it looks like they were originally marketed by ATF, but still no definitive name or ad for them has been found. Going back to something Mr Baranowski said earlier, - the problem of translating arcane typographic terms from one language to another there is help to be found. Europe used to have a vast printing exhibition every fourth year, which changed its name and location every time. When it was the UK’s turn it was called ‘IPEX’, when German’s ‘FOGRA’ and so on. The catalogue and guide sold at the door, was several inches thick, and in the back were many indexed pages in various languages of printing terms. All you’ve got to do is find a copy from around the 1965-75 era! I don’t think you’ll find these in a catalog as I have a very strong feeling these were use specific for type casting operations. They also date from late 19th Century and early 20th Century. 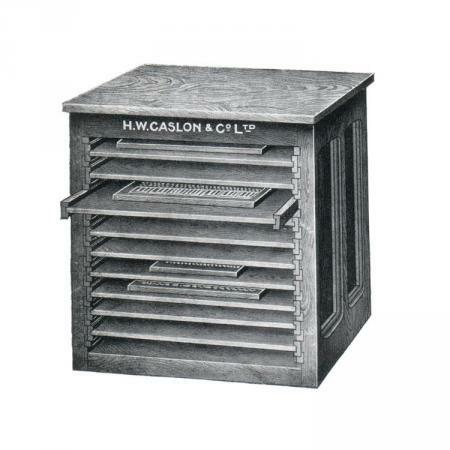 Certainly by the 1960s, production of wood cabinets was long gone and the major US suppliers, namely Hamilton and Thompson, were makers of all steel cabinet work. The ads Hamilton was placing in publications like the Inland Printer in 1965 were for steel goods to compliment the new high speed line casting machines that were introduced in the early 1960s. There was very little market left for new composing room equipment by the end of that decade. And to support this theme, Linotype advertised the availability of their new Helvetica mats in the October 1964 Inland Printer, then they reported in the November 1964 issue that they had sold 658 Elektrons to that point, December featured the Linofilm, January slipped back to the Elektron, February was again the Linofilm, and March ended that volume with the Linofilm. The push to offset and other than hot metal composition was in full swing by then and letterpress started to slip badly. Projected purchases of letterpress equipment was a fraction of offset, and by the 70s the main percentage of letterpress left was in publication work, magazines and newspapers. The change over in other countries was somewhat slower than the U.S.